Long overdue reissue of above average 1964 portmanteau film featuring the youthful efforts of some of the French New Wave’s finest. The idea was to invite six directors to contribute a short film named after and set in a particular part of the French capital. Jean Luc Godard, Claude Chabrol, Eric Rohmer, Jean Rouch, Jean-Daniel Pollet and Jean Douchet took up the challenge, with very fascinating results. Godard headed for the Montparnasse-Levallois and made a romantic farce of telegrams and infidelity. Chabrol and his real-life wife Stéphane Audran play a bickering couple whose son takes drastic steps to silence them. Rohmer delivers up a suspenseful tale of fashion and fear at Place de l’Étoile. Rouch’s short, a single take study of a woman moving from an argument with her boyfriend to a casual liaison at Gare du Nord remains the pick of the bunch by virtue of technical ingenuity while Pollet and Dochet detail the travails of young women, one a prostitute one an American student. 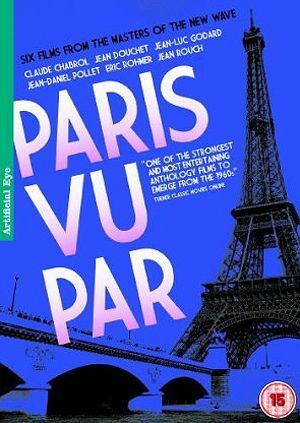 Rarely screened and hiding many burgeoning talents (Nestor Almendros and direct cinema pioneer Albert Maysles shot two of the films), Paris Vu Par is a treat. Minimal extras.